Alexandria Ocasio-Cortez has been allegedly involved in a huge money scandal with her boyfriend, Riley Roberts. The former bartender was confronted this week by a conservative investigative reporter when he noticed her boyfriend had his own congressional email address. Only paid staffers are supposed to have official “house.gov” email addresses, and Roberts wasn’t listed as one of her employees. Well, that was just the tip of the iceberg. 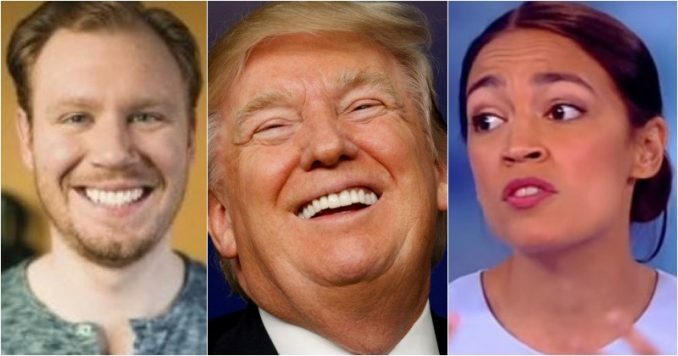 The corruption goes much deeper, and AOC is going nuts. It all started last Friday when conservative reporter Luke Thompson confronted Ocasio-Cortez about what he just found out. You see Thompson had discovered AOC’s live-in boyfriend had an official “house.gov” email address, and the funny thing was Mr. Roberts wasn’t listed as a paid staffer. “Last Friday, my mentions died for your sins. I posted a screen grab of Riley Roberts’s House Microsoft Outlook card, including his official house.gov email address, office phone number, and his designation as ‘Staff’. Roberts is the boyfriend of Alexandria Ocasio-Cortez. The Congresswoman was upset,” Thompson said. “Throwing caution to the wind, she stormed into my [Twitter] mentions, asserting this was just a way to give Mr. Roberts access to her official calendar,” he added. That’s when AOC went nuts. She decided to attack Thompson hoping he would go away. AOC responded: “Actually this cal designation is a permission so he can have access to my Google Cal. Congressional spouses get Gcal access all the time. Next time check your facts before you tweet nonsense.” But she wasn’t telling the whole truth. Thompson did some more digging and was shocked by what he uncovered. So, the question became why does a non-staffer have to have access to a Congress member’s Google calendar? Well, what if he really was getting paid, but for doing nothing? The big cover-up involves AOC and a shady leftist political action committee, who backed the 29-year-old for Congress and helped finance her campaign. This PAC is called Brand New Congress, an organization founded and run by Saikat Chakrabarti, who just happens to now be Ocasio-Cortez’s chief of staff. Now, at this point, Luke Thompson hadn’t uncovered the payouts to AOC’s boyfriend Riley Roberts, but since Chakrabarti and Ocasio-Cortez were panicking, he suspected that he was on to something pretty big. Thompson went to the Federal Election Commission, and that’s where he struck gold. “Indeed, while Brand New Congress PAC’s (Chakrabarti’s organization) ten largest expenditures were paid to Brand New Congress LLC for ‘strategic consulting,’ a sum that totaled $261,165.20 over the course of the campaign, its eleventh and twelfth largest expenditures were paid to Riley Roberts,” Tompson claimed. Yet, Riley Roberts was getting some payments during the campaign. Brand New Congress PAC paid Roberts $3,000 on August 9th. Then, eighteen days later, AOC’s campaign paid Brand New Congress LLC $6,191.32. They turn around and pay Roberts another $3,000. “It looks to me like Chakrabarti was effectively reimbursing AOC for a third of her expenses with Brand New Congress LLC, perhaps so that she would stay in the race despite her mounting debt,” Thompson concluded. If proven true, this is most definitely an FEC violation. It sure looks like AOC is in hot water and by watching her meltdown on Twitter last night, she knows it’s just a matter of time. The former bartender wanted to play in the big leagues, and now she has been exposed as being part of the swamp.